La Trobe News digital screens display the latest updates from La Trobe University across our Melbourne Campus and City Campus. A ticker tape, videos and graphics are updated frequently to provide service information, the latest news from the University and reputational material. All screens are centrally managed by the University's Internal Communications team within the Marketing and Recruitment division. You can find the screen locations and information on how to have your information shared on the screens below. 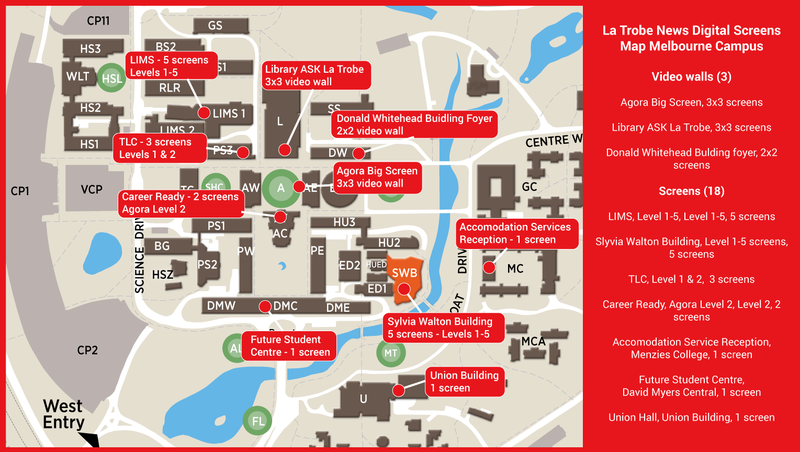 There are four video walls and 18 digital screens on the Melbourne Campus and City Campus at the following locations. If you have existing artwork, please submit your digital screen content request using the online form. all text must be short. If you are a La Trobe staff member and you want to create a digital screen slide for a La Trobe event/campaign/service - you can submit a digital marketing request to Creative Services. Forward a link to your captioned .mp4 video file and your .srt caption file. Before making your content submission please review the following documents. If you have any feedback on the La Trobe News digital screens and its content please let us know using our feedback form.